I don't think I ever showed you one of those and though you can find many in Paris. They are made by a street artist called Giaco, who's art is precisely to use street furniture and equipment to turn them into artistic objects of scenes. In the present case he used one of the many grids that allow the sewers to receive light as a thoracic cavity for this skeleton. I love it! Anyway, nothing to do with what is going to keep me busy for the next 3 days: Le Web, a big Internet conference that takes place every year in Paris and that I have never missed since the very first one (it was called Les Blogs at that time)! 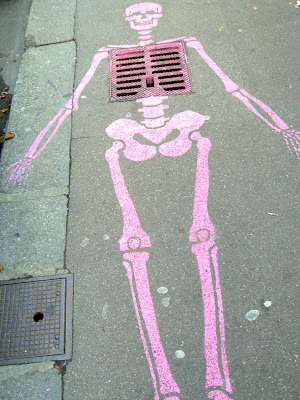 In July I´ve seen two of these skeletons (a pink and a blue one) next to the Ecole Militaire. I loved them too! Too clever LOL! Reminds me of Picasso's use of a bicycle handle for bulls horns and the seat for the bull's face. 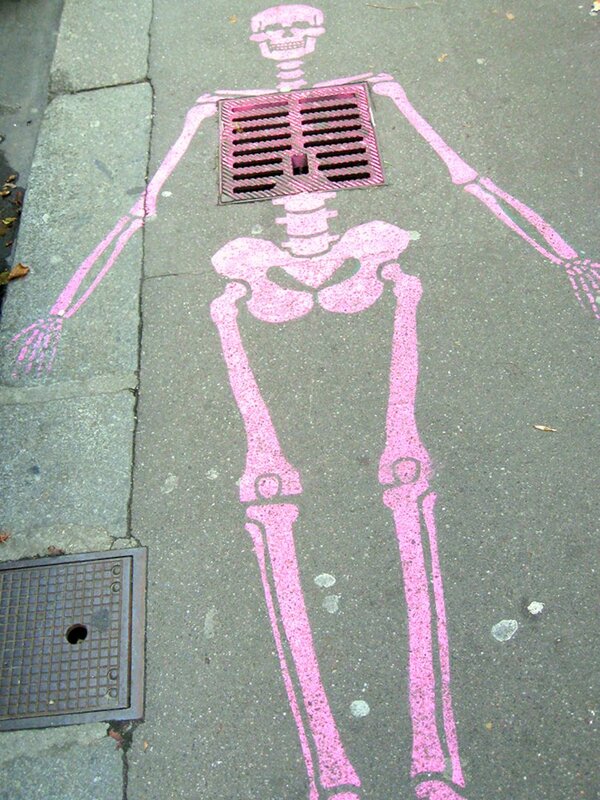 Now I will forever see the chest of a skeleton when I see pavement grid work. Art surely makes you see things in a different way. Excellent! Normally I don't like street art, or graffiti, but this is witty. It reminds me that eating is not only enjoyable, it's important! oh how fabulous! Love this! This is SOO clever - I love it. BTW : enjoy the conference, Eric. Isn't it fun to see art in the everyday??? LOVE it! Géniale! Enjoy the conference—looks like there are lots of interesting speakers but why are you not one of them, eh?